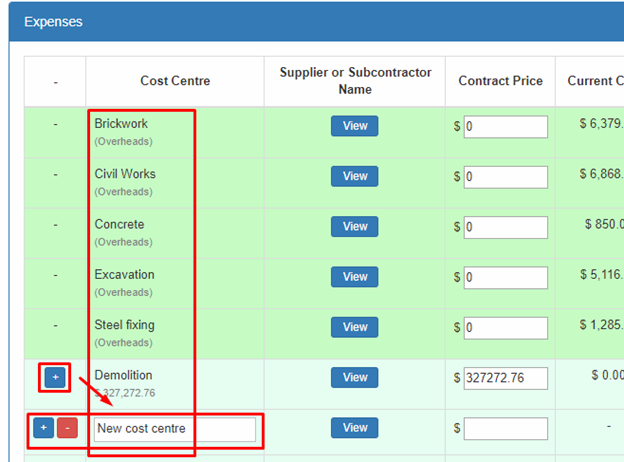 Cost Centre Settings modifies which cost centres will be displayed on the suggestions when you type in on the Cost Centre field. 1. Click Settings button on the upper right corner of the timesheet form. 2. Choose Cost Centre Options. 3. The items under Cost Centre Settings are the sources of cost centres that will be displayed on the Cost Centre field in the timesheet. 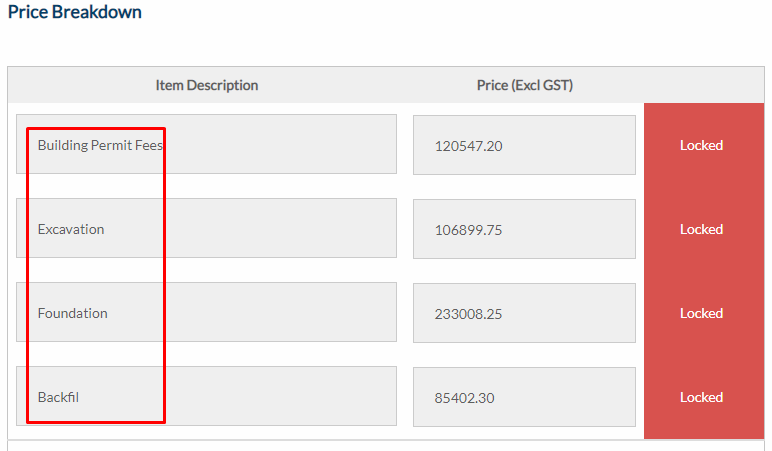 Check/uncheck the items you want to be included as sources of cost centres for displaying on the suggestions. These are from your items under Price Breakdown and Variation Breakdown. Note: Only projects with Payment Claim System type have project breakdown. If your project is of other type, checking or unchecking the project breakdown option will have no effect to your cost centre field. These are the listed items under Cost Centre column from your Forecast Report. Note: If you have added a cost centre (using the "+" button) on the forecast, it will also be categorized as cost centres in forecast tool. These are from the My Cost Centres library. This page can be accessed if you go to Management > Control Panel > My Cost Centres. 1. Cost Plus and General Payment Claim - if your project is either a General Payment Claim type or a Cost Plus Payment Claim type, the library will be coming from this page. Note: Small Builders provided default cost centres in this library. 2. Payment Claim System Cost Centres- if your project is a Payment Claim System type, the library will be coming from this page. 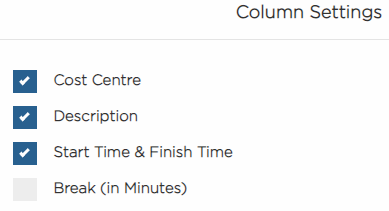 Column Settings modifies what columns are displayed on the timesheet. 3. The items displayed are the columns that you can see on the timesheet. Check the items that you want to appear on the timesheet and uncheck to hide. This feature allows the employees listed to make timesheets for other employees in the company. 3. A modal will be displayed. Click the checkbox for AVAILABLE TO ALL EMPLOYEES if you want all employees to make timesheets for other employees. By default, checkbox is ticked and ALL EMPLOYEES are allowed. 4. To specify the employees who will be given the access privilege, remove All Employees by clicking X. You will be retained in the field if you are the owner. Click on the field to add another employee.